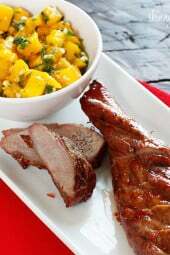 I thought this Asian inspired sweet and fiery pork tenderloin dish with mango salsa would be a great way to celebrate the Chinese New Year on January 23rd, the start of a 15-day celebration celebrating the Chinese New Year – This year it’s the Year of The Dragon. I love Chinese take out so when I successfully make an asian inspired recipe to satisfy my cravings, I am one happy gal. Some of my other favorite asian inspired recipes are Grilled Bourbon Chicken, Pepper Steak and Honey Teriyaki Drumsticks or Salmon. 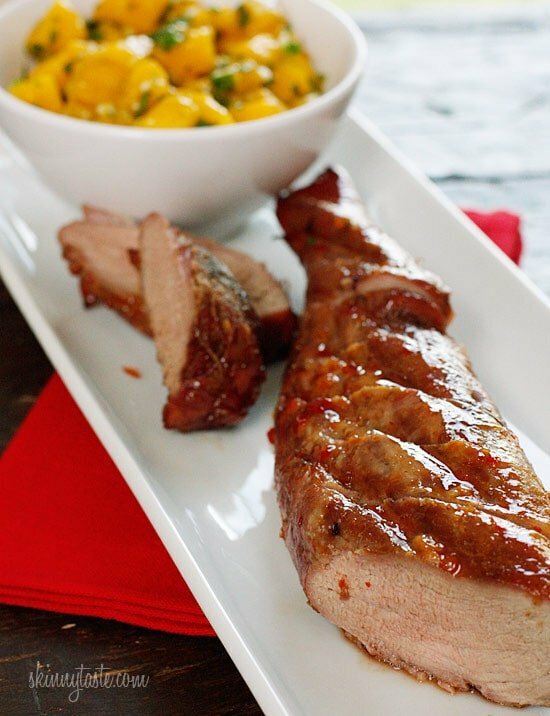 Roasted pork tenderloin with a sweet and spicy glaze topped with a fresh mango salsa. Your taste buds will be tantilized with each bite you take. 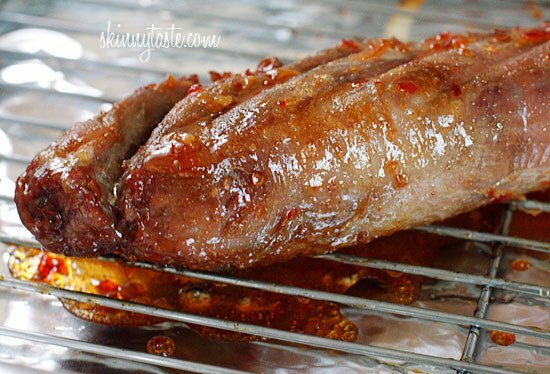 Even if you have no intentions of celebrating the Chinese New Year, this is a tasty way to make a pork tenderloin if you are looking for something different. Could you make this with chicken? Sure! This would be fabulous over a chicken breast if pork is not your thing. I served this with my own coconut rice creation that my husband loves (recipe coming soon) and he literally cleaned his plate! 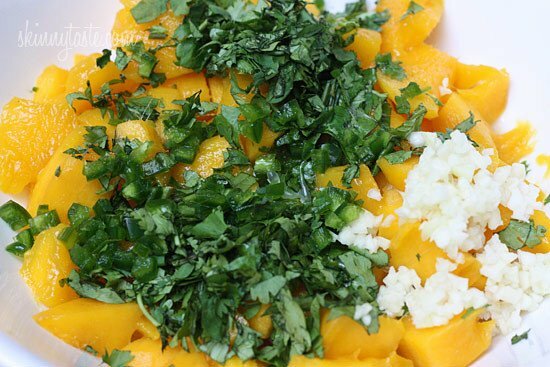 You could also serve this over steamed jasmine rice for a simple side dish. Enjoy! For the salsa: Combine all the ingredients in a bowl, season to taste with salt and pepper. Refrigerate salsa until ready to serve. Makes 1 cup. Preheat oven to 375°. Mix garlic salt and ginger in small bowl. Rub evenly over pork. Place pork on rack in foil-lined roasting pan. 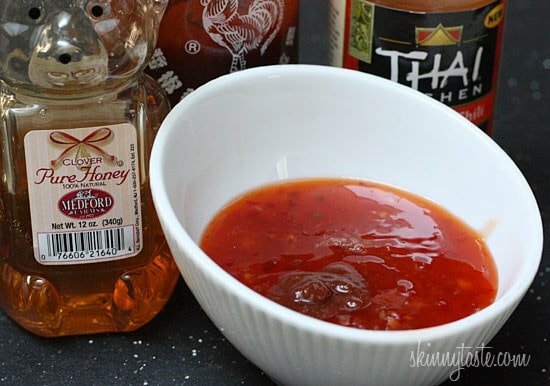 Mix chili sauce, honey and sriracha in small bowl. Brush over pork during the last 10 minutes of cooking. Slice pork and serve with pan juices and mango salsa on the side. I would love to know the time and temperature, if you cooked this in the air fryer. Has anyone done this? Absolutely fantastic (even without the mango salsa!) I only had ingredients for the pork so I made it anyway. To my 3 pounds of pork tenderloin (one package of a 2-pack from Costco) I tripled the sauce recipe. Worked out perfect! I don’t think I’ll bother with the mango salsa unless I have stuff on hand because this was perfect. I will prob add a little more sriracha next time, but otherwise not change a thing. I DID baste my sauce over the tenderloin at about 5 min and then at the end because it seemed to slide right off. Makes a good sauce to spoon over the meat for plating. Thanks again for a great recipe!! I made this for dinner tonight and even the thin end of the pork stayed juicy. I didn’t make the mango salsa because the store didn’t have any ripe ones so I served it with roasted vegetables instead. I’ll be making this again. how many freestyle points is this? This is perfect for company or every day. I serve it brown rice and roasted veggies. Everyone loves the salsa so I make extra. I have made the salsa with pineapple too. Thanks, Gina for another delicious recipe! I don’t comment on recipes, but I am going to make an exception for this one. Cooked it for dinner tonight and it was delicious! I’ve enjoyed all of your recipes to date but this is the bomb! Had it with Thai coconut rice. Your website has expanded my repertoire of meals greatly. And I cook much more healthily. Thank you. If I used pork chops instead of a tenderloin, what would I need to do differently? 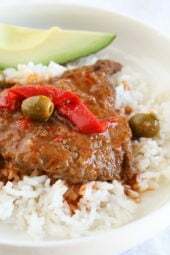 I can't read all the comments, so maybe this was mentioned, but I plugged this recipe into the Weight Watchers Recipe Builder (without the salsa) and it is 5 Smart Points per serving. I selected "16 oz Pork Tenderloin, lean only, raw". Is that correct? Otherwise, not sure why its coming out to 5 instead of 4 SP. Making this weekend, looks fabulous! Question, ground ginger in the spice section or the wet kind ground jar in the produce section? I made this for the first time tonight and everyone loved it! So many flavors. I will definitely make this again. I wanted to eat the mango salsa up all on my own! The mango salsa was AMAZING!! This will be a new regular for me with chicken or pork, quinoa and veggies. Thank you!! 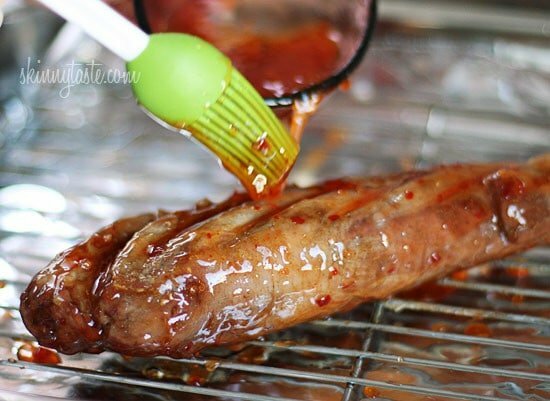 I would like to try this in the slow cooker…any thoughts? I'm thinking 8'ish hours on low, but wondering when to add the sauce. I can't wait to try this tomorrow night! What is Sriracha sauce…I don't think I've seen that before. Any ideas on a substitution? I tried this recipe tonight. It was fabulous!!! The tenderloin was well……..so tender!! Thank you many times over for your great recipes. I am going to try this with chicken next! I bow down to your amazing cooking skills!!! I was always a failure at cooking meat in an oven untill is recipe. 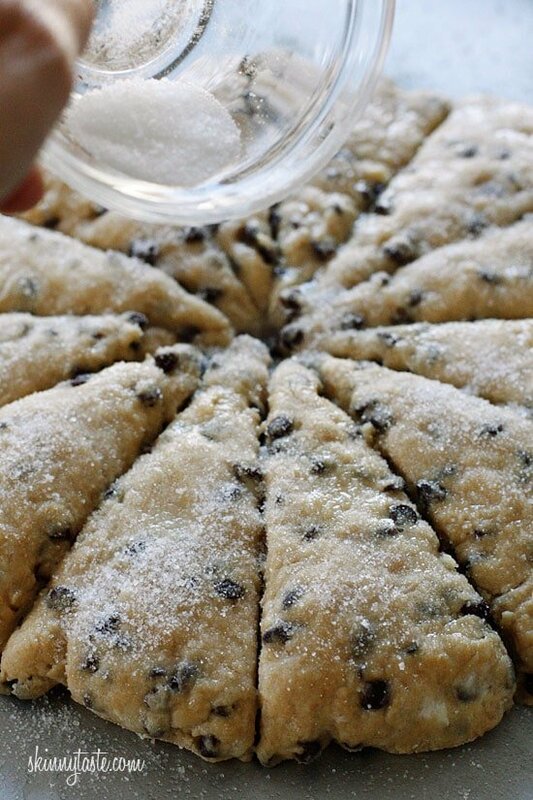 This recipe itself is fabulous and delicious! 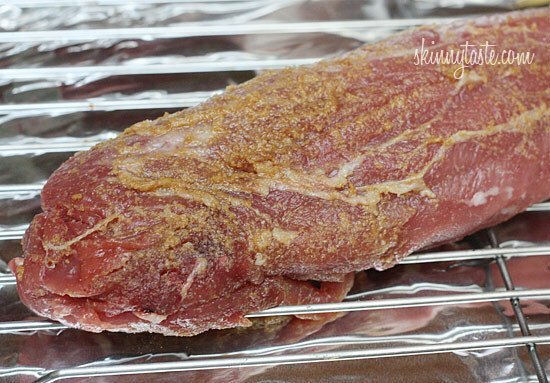 But, now I use is as a base for cooking my pork tenderloin to my liking, I've used many different spices as the dry rub portion and have tried many different sauces for the last ten minutes, my favorites are your sweet chili sauce, teriyaki, and bbq! I love when a blogger really takes the time to teach you how to cook it right! Thank you! Made this last night with the coconut rice and it was AMAZING!!! My husband, a tough critic, devoured it! Just finished eating it for leftovers tonight (made two tenderloins). Will definitely be making this again and again! This recipe was amazing!!! I think I may make that mango salsa and eat it with my Baked Scoops it was so good! The combination of the flavors of the pork and salsa was wonderful. I served it with couscous, roasted yellow squash and zuchinni & broccoli slaw. I will have to try your coconut rice you mentioned. thank you for posting such awesome recipes! I couldn't find the Sweet Red Chili sauce so I picked up Garlic Chili Peppper sauce (A Taste of Thai). Do you think this will work? Does roast it in the oven just mean bake? Do you happen to know the calorie count if you don't use the mango salsa? Made just the pork tonight. We all loved it! My 22 month old I think loved it the most which is saying A LOT. Thank you so much for all your hard work! Oh and I probably used only about 1/2 the sauce which I'm sure affects the nutritional information. Maybe I missed it but you should tell people to let the pork loin rest for 5 or 10 mins after it's out of the oven. I've noticed this recipe is so much juicier when the meat is left to rest. Good job on this, me and my girlfriend love it! Im sorry, buy I tried this and did not like it at all! To be fair, it was my first time cooking loin. It was cooked well and not over or underdone. The sauce was ok but I just didnt like it. This was delicious and will be added to my weekly line-up. I cook this probably once every 1 – 2 weeks, rotating it between pork, chicken breasts and salmon filets.. and it is delicious! I could eat it every day for dinner, so could my husband. Thanks, Gina, for all of your amazing recipes! I'd say I use your recipes 4-5 times a week and you've helped my husband and I eat healthy and tasty foods for the last two years! Keep up the great work, it is definitely appreciated. If I had to pick only one animal to eat the rest of my life it would be the PIG!!! I love PORK! 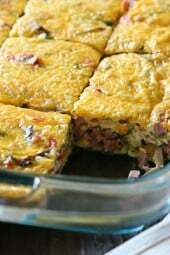 This is a great recipe, I made it tonight, except I used my homemade peach salsa that I canned this weekend. It was quick and easy! THANKS AGAIN for all your great recipes. I made this last night for my boyfriend. He said, this is a make again recipe. We both loved it. The textures and combination of flavors was amazing! I did leave a couple of seeds w/the jalapeno and the salsa ended up being a little hotter than we both liked but, I guess it is a learning experience. Since, I made the shrimp salsa that seemed a little blah when I took out all of the seeds from the jalapeno. This would be good even with out the salsa we decided. I made this last night and it was AMAZING. My boyfriend LOVED it and already wants me to cook it again for him! Had this last night, my husband said it was by far the best thing I've ever made (I'm not the cook in the family:) ) It was delicious! Went very well with the coconut rice (though not that coconutty as I expected). I paired it with steamed snow peas and shredded carrots. Thanks for such a great recipe!! Delicious! We didn't have the salsa yet because I didn't want to go to the store. I needed a recipe for pork when the thunderstorms ruined our grilling plans, and I had all the ingredients for this. My DH's exact words were, "We should never grill pork tenderloin again!" Thank you so much for your creativity and recipes! This recipe is amazing! 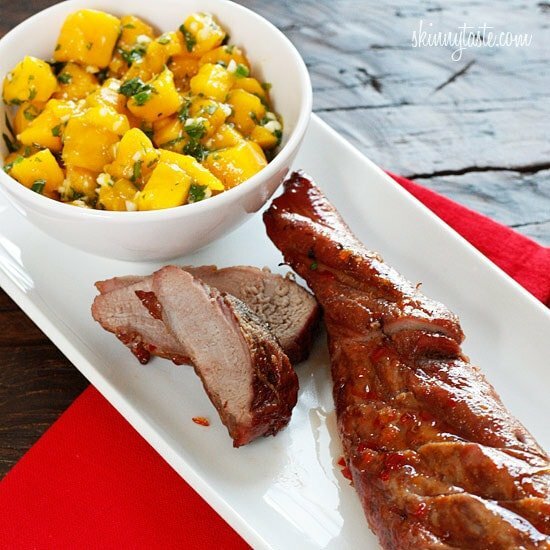 The mango salsa complements the spiciness of the pork tenderloin so well! Thank you. I found a sweet Thai chili pork tenderloin at Sams club, I made that so I wouldn't have to drag 3 kids around looking for Thai red chili sauce. The mango salsa was amazing!!!! And the 2 together were to die for!!!!! It's a catch 22 because I want to eat way more than I should. My husband, the hard to please man, loved it and even asked for that salsa again tonight when we were having chicken. Thanks for the awesome recipes!!! We made this tonight and loved it! It's perfect for us. I love the sweet and my husband loved the heat. This goes on our favorites list. Keep them coming! I love this soooo soooo yummy! This was so tasty! I bought pork tenderloin at our local farmers market, and the flavors from the rub and sauce were delicious. This was a huge hit in my house. As my husband said, "Another winner!" Thank you so much, Gina. You are so talented at what you do! Loved this recipe! I made it for my family last night, and was a definite hit! I'm sure I'll be making it often. I also made some Coconut Brown Jasmine Rice to go with it. I made this tonight for dinner and it was absolutely amazing! 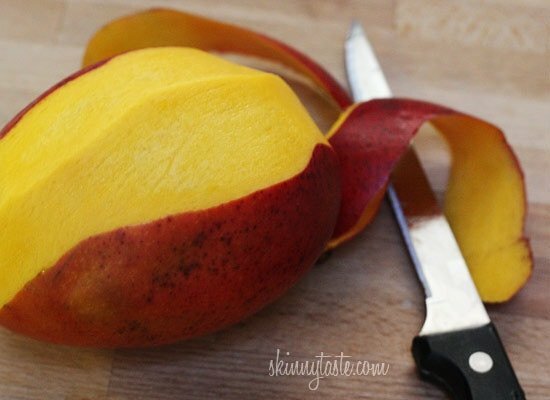 You need to make sure the mango is ripe or the salsa will be bitter. The sweet chilli glaze was a hit! I will be making this again and again!! I am so glad you included this in your Father's Day post, because I missed it the first time around. Made it last night and, truly, one of the best things I've made from this site – and possibly ever! Easy yet… moist, flavourful, succulent, delicious. Words fail me. Will be making this frequently. Thank you so very much, Gina! Let me just say it didn't last! Will definitely be making it again! I made these with just 2 chops that I cut from a big piece of pork loin that was on sale! Cut down on the time to 30 mins. It was amazing! AMAZING. My husband said it was fantastic (first time in our 5 yr marriage he has used that word to describe dinner and I cook a lot of good food..or so I think). Do I baste after the pork has cooked for 45 mins or do I do it at 35 mins…kinda confused and want to nail this recipe as it looks delish! I basted with 20 min left and again at 10 min left. I made this for dinner tonight and it was amazing! I made an extra tenderloin so we could have leftovers 🙂 I served it with sauteed red and orange bell peppers, fresh green beans and sliced garlic cloves – delish! I've cooked a few of your recipes and every one has been awesome! I love how easy and full of flavor your recipes are! I've cooked at home more thanks to you – Keep them coming! 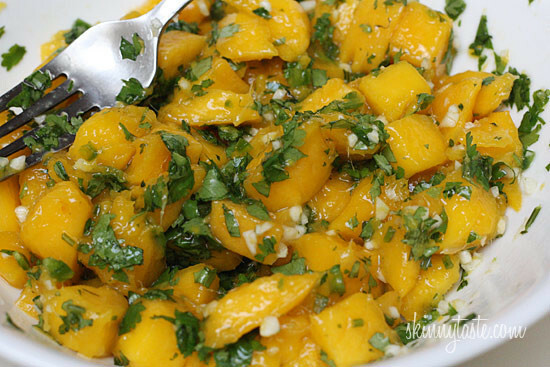 I added papaya to the mango salsa, it was delish! I never comment even though we eat off your site pretty much every night, but Jesus, Mary, and Jerome, this was INSAAAANELY good…so good that my husband packed up the leftovers for his lunch tomorrow before I could even get another piece. I might have to kill him. Thanks for posting this simple, delicious recipe! Finally got to try this – delicious! I got home from work late so I sliced my pork into medallions and sauted them on the stove in a little bit of olive oil, then glazed them with the sauce for a few minutes. So delicious and on the table in no time. For those looking for Thai Sweet Chili sauce – Frank's Hot (the buffalo sauce) also makes one now that is with the BBQ sauces if you can't find it with the Asian condiments. I made this for dinner tonight and it was delicious! I added pineapple to the mango salsa. It was a great side with the pork. 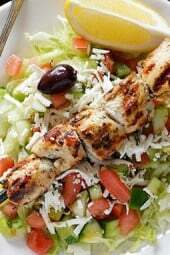 Thanks for all the yummy recipes – really helps me with the WW program!